Paramedic Hugo Badillo has been a member of the American Medical Response team for five years. 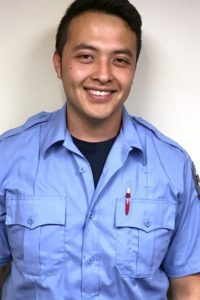 Hugo earned his EMT certification in 2011 and completed his Paramedic studies last year. Hugo’s positive attitude and uplifting spirit inspire those around them. Hugo is known for having a strong work ethic and can-do attitude, regardless of whether he is on or off the clock. Last December, Hugo was dropping a family member off at home when he heard a woman screaming. Hugo was off-duty but investigated anyway – and found an unresponsive toddler in the woman’s arms. Hugo assessed the situation, performed back blows and chest thrusts, and then began CPR on the pulse-less child. After approximately two minutes, the child began to breathe on his own and regained consciousness.